Same great program you have known for over thirty years. Founded in 1983 by Cathy Heuckendorf, Growing With Music created a developmental music curriculum licensed by qualified teachers and offered in schools, daycares, and other community settings in Minneapolis-St. Paul and around Minnesota. We connect highly trained music teachers with schools, daycares and families throughout the state. After more than 30 years in business, Growing With Music is an experienced advocate of early childhood music education programs in Minnesota. We are honored to be a Minnesota Parent Magazine Editor’s Choice for Superior Services award winner. Each Growing With Music instructor's interpretation of the curriculum not only helps develop kids’ musical skills, it contributes to overall childhood development, including social, motor, academic and communication skills. 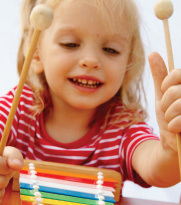 The entire curriculum supports the Pre- Kindergarten National Music Standards of the Music Educators National Conference. Whether you’re interested in finding music education or music therapy for children in a child care setting, or are looking to join a class in your neighborhood, Growing With Music helps connect music instructors with classes of all sizes. Cathy Heuckendorf, MT-BC received her Bachelor of Science degree in Music Therapy from Augsburg College in 1981. In 1983, she founded Growing With Music to share the joy and benefits of music with children. Cathy is a member of the American Music Therapy Association and in 1999, she received the Outstanding Music Alumna Award from Augsburg College. In addition to serving as President of Growing With Music, Cathy conducts workshops, mentors music therapy students and researches the latest innovations and standards of practice in the field. This site is to provide information regarding the Growing With Music program. You shall not broadcast, duplicate, copy, reproduce, edit, manipulate, modify, publish, rent, sell, publicly display, distribute, transmit, or circulate to anyone the contents of this site, or use for any commercial or promotional purposes, without the express written consent of Growing With Music, Incorporated. The keyboard design, name and format of the logo are an incontestable, registered federal trademark. 1983 - © Growing With Music, Incorporated. All Rights Reserved.